Those new to the sport will soon realise that no American nation plays Test cricket. But if they stick with it, and start to take an interest in the history of the game, then cricket in the Americas is one of those subjects that will, eventually, finds its way into their peripheral vision. The cause is most likely to be reading somewhere about the great all-rounder and swing bowling pioneer, Bart King. Other possible catalysts are the fact that the USA v Canada match is the oldest international fixture in existence or, perhaps more for our Australian brethren, learning that a side led by Arthur Mailey and including the mighty Bradman, honeymooning at the time, toured North America in early 1932. His or her desire for further knowledge thus stimulated the fledgling historian was, until now, then liable to become frustrated in their attempts to learn more. Whilst it is at first blush surprising that no complete history has been written in the past, a little thought soon explains that. The Americas as a whole are a huge place and, to the extent that cricket had a heyday there, it is far in the past and those with first hand knowledge have long since passed away. There are some good sources of information. Some fine books have been written on the main Philadelphian clubs, and a particularly handsome volume on the history of Philadelphian Cricket as a whole, authored by King’s teammate John Lester. But A Century of Philadelphia Cricket was published in 1951, and John Marder’s thoroughly researched book on The International Series between the USA and Canada was written nearly half a century ago, as was Colin Whiting’s Cricket in Eastern Canada. A more recent book had appeared, The Tented Field by Tom Melville, published in 1998. I will say straight away that I have not had the benefit of reading Melville’s book, although I understand it is heavy going in places. One suspects that part of the reason Jayesh Patel extended his book to the whole of the Americas is in order to distinguish his work from Melville’s. The existence of Melville’s book notwithstanding, as well as that of a modern book on Canadian cricket by Patrick Adams, Patel set himself an enormous task in deciding to plug this particular gap in the game’s literature. His first problem, although I doubt it troubled him, was that the project was never likely to attract the interest of a major publisher. It is a sad truism that as a general rule the cricket books that deserve to sell the most copies generally shift very few. But for many authors, and I am sure Patel comes into this category, sales matter rather less than the satisfaction of a job well done. In fact the book is self-published, and very nicely done too even if, as is the bane of such ventures, there are some mildly irritating typographical errors and a few passages where a bit of editing would not have gone amiss. As to the content of the book this inevitably leans more to the distant past than it does the present, given the highest standards the American game had reached to date occurred in the years leading up to the gathering of the dark clouds of the Great War. The King-inspired Philadelphians were a decent side, well able to compete on even terms with English county sides. They did not have the strength in depth to have presented a consistent challenge to the full might of England or Australia, but I suspect they would not have disgraced themselves had they joined England, a less than full strength Australia and the South Africans in the ill-fated Triangular Tournament in 1912. All cricketing bibliophiles know that in truth there is a good deal of writing out there about the early days of American cricket, so much so that with access to a dozen or so books, coupled with a set of the long running American Cricketer magazine Patel could have got away without doing a great deal more. It therefore makes his book all the more impressive that he has clearly gone well beyond those sources to gather new material for Flannels on the Sward. Inevitably the most interesting question, and one that can only ever be a matter of conjecture, is why cricket, despite a healthy start, never really took hold in the USA, and indeed has never regained the lost ground despite the substantial numbers from the Caribbean and South Asian Diaspora who have settled there since the game’s decline began. Patel spends one of his closing chapters wrestling with this thorny issue, setting out the various ideas that have been put forward over the years. He does not come to any particular conclusion himself, probably wisely, but does make the highly relevant observation that the reasons generally put forward are in many ways just as applicable to India, or even Australia, yet have not had the same result. To my mind Flannels on the Sward could quite reasonably have stopped at the point I have highlighted in my preceding paragraph, but in fact it is from there that it goes on to deal with the game in Central America and South America* as well. This is done by way of a series of short summaries, none containing a great deal of material, but given the limited influence the game has had on those nations only one providing much disappointment as a result. That solitary exception is Argentina. Some strong English sides toured Argentina before and after the Great War, and First Class matches were played, not all of them won by the Englishmen. Patel’s whistlestop tour through South America alights on them for only a paragraph – I do hope that one day someone will write a history of the game in that country. 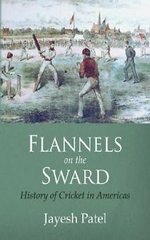 I am sure it will clear by now that Flannels on the Sward is not a book for the casual cricket fan. For serious students of the game however, or those who are curious about its history in the Americas, it is thoroughly recommended. It is a reasonable price at around USD24 for the basic version, and around double that for a full colour edition. Judging by the number of photographs in the black and white edition, and their subject matter, I would think the additional outlay is worthwhile. I will also add, for the benefit of the author/publisher, despite it being Cricketweb policy to discourage the purchase of such items, that a kindle edition can be had for a mere USD4.99.